(Newser) – Al-Qaeda's media arm has released an audio in which the purported son of the late al-Qaeda leader Osama bin Laden threatens revenge against the US for assassinating his father, reports the AP. In a 21-minute speech titled "We Are All Osama" released by As-Sahab Saturday, Hamza bin Laden tells Americans that they are accountable for the decisions of their leaders. 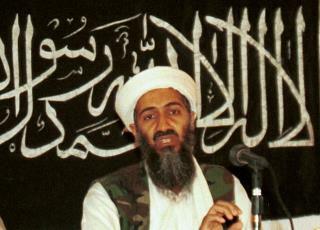 He says al-Qaeda will continue waging jihad against the US in response to its "oppression" of Muslims. "If you think that your sinful crime that you committed in Abbottabad has passed without punishment, then you thought wrong," he says. Let's catch little homo Hamza and feed him some ham. Son seeking revenge for the death of his father? This is so unexpected! Should anyone expect anything else? Anyone murdering any of my family members, should not expect anything else but retaliation of the worst kind. The only way of stopping such retaliation is, complete and total annihilation of the clan, no survivors allowed. Every member must be hunted and put down whenever found on the spot. Obviously our Political Leadership would never authorize such action, therefore those clan members are feeling duty bound to attack in every way possible in perpetuity, anything and everything even remotely connected to USA.